It was the ninth day of our eleven day tour of the Canadian Maritimes. We had started in Nova Scotia where the attractions were the striking natural beauty of the landscape and certain remnants of its early history. We had toured a replica of the Hector, the first ship to bring Scottish settlers to Cape Breton. We had visited Fort Louisbourg from the which the French, who tried to challenge British control of the area, were twice routed. We had also enjoyed a lobster dinner, a feast really–seemingly endless buckets of steamed mussels were the warm-up for the whole steamed lobster that each of us was served. No one thought to ask if the lobsters had names. It would have seemed both ghoulish and absurd. But we had already learned that the lobster season was the necessary engine of the whole year’s economy and that this year’s catch was particularly generous. Prices were down. From Nova Scotia, we went by ferry to Prince Edward Island. I had been surprised to find Anne of Green Gables on the pre-tour reading list. I was even more surprised to find how central to the whole island the novel–and the house that inspired it–had become. I shouldn’t have been. When a friend learned I was going to the Maritimes, her first words were, “Tell me you’re going to Green Gables.” The story is that when the Canadian National Park service was given the task of setting up a park for PEI, the appropriate spot was the lovely beach of the northern coastline along the Gulf of St. Lawrence. But the Green Gables house was also there and already too valued. So it was included in the park as a cultural piece and, along with an adjacent golf course, came under the control of the Park Service. Today there is a shop a square city block in size called simply the Green Gables Shop and selling everything you can imagine. Tour buses with fans from all parts of the world clog the road to Green Gables. The Japanese, it seems, are red-haired Anne’s most ardent fans. Hew novel was translated into Japanese and many other languages shortly after its publication in 1908 and the Japanese were immediately enchanted and have remained so. Japanese tourism, that phenomenon of the second half of the last century, has made Green Gables a Mecca. Go figure. The coastline of the Stanhope Beach area gave us some limited access to several endangered species of birds nesting safely in its protected areas, including the nearly extinct piping plover. I waded happily in the surprisingly warm water and shmoozed with the locals. There was not a lobster in sight. For dinner I searched for a restaurant that featured steamed mussels. If you find mussels on the menu of a quality restaurant in L.A. and ask where they’re from, if the answer is PEI, you know you’re in for a treat. I couldn’t wait to savor them right out of the water, as it were. 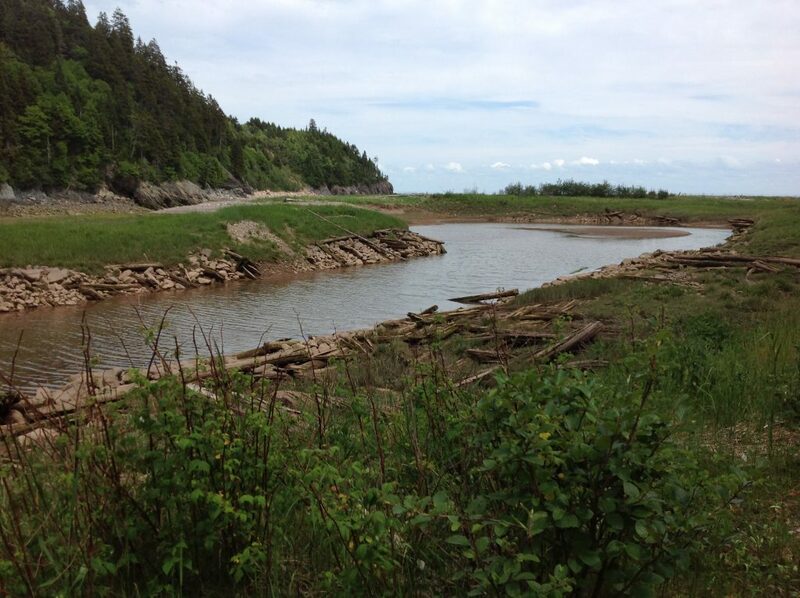 Then it was on to New Brunswick and the magnificent Bay of Fundy. 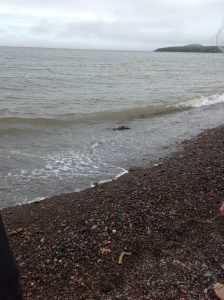 The Bay of Fundy’s tides are without equal. At the apex of the bay, its narrowest point, water rises some twenty-eight feet twice a day. So powerful is this movement of water that gigantic turbines are being sunk there to generate electricity without the necessity of dams with their negative impact on the environment. But we were there for the beauty and the drama. 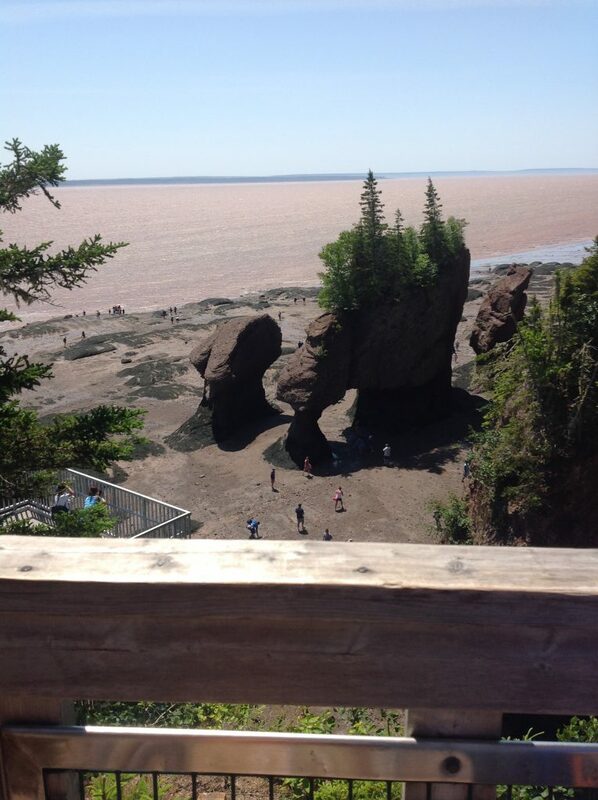 We stopped first at the Hopewell Rocks. The tide was out, way out, and we climbed down about 4 flights of stairs to walk about on the ocean floor. As they rose and fall the turbulent and relentless waters had carved and eroded yawning caves and free-standing monoliths. A group of the monoliths were named the flower pots because at the tope of these giant formations trees and shrubs had grown above the water line. This was not a place for lobster fishing, but for recreation, awe and, recently, electricity. That night we stayed near another cove farther down on the bay where the tidal movement was somewhat less dramatic but with similarly beautiful results. On a long walk we took in more erosion sculpture, more fields of lupin and buttercups and a small village that had grown up around a very navigable cove claimed by a lobster fleet. There we heard the story of the ten pound lobster caught a few days before. There was a line to view the phenomenal sea creature and we joined it. The fisherman who caught it and was showing it proudly thought it was about ninety years old. I was off taking pictures of the local covered bridge when the conversation started. I returned to the group to see someone collecting money and heard someone say, “It’s just like saving Nemo” I raised an inquisitive eyebrow toward my husband and he explained. Someone had decided that we should save this unusual lobster and the group had quickly collected the $90.00 Canadian the fisherman was charging. Our guide, a savvy local woman, carried on the negotiations. 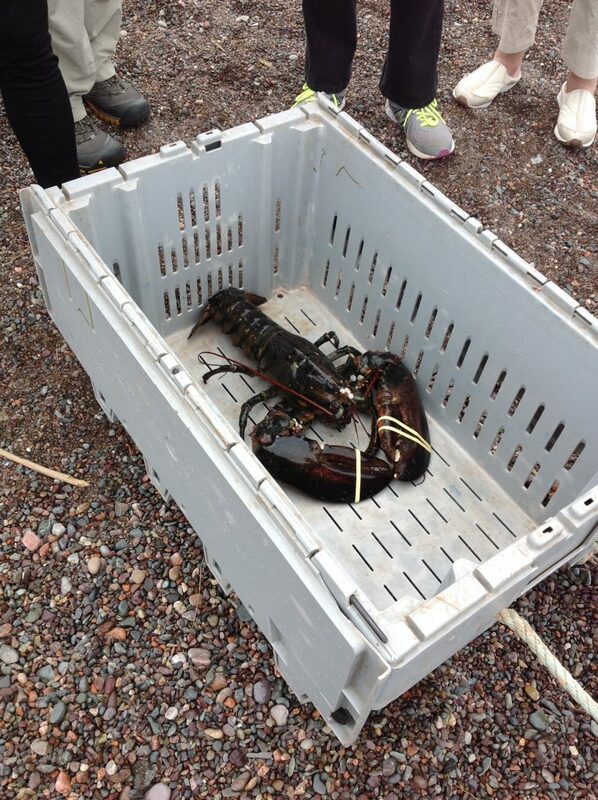 We would pay for the lobster but only if and when we had witnessed his release to the water. A time was set for that evening. The rest of the day was spent at the Quaco Museum where we learned about the Loyalists who had settled the area and the rich legacy of ship building. The Loyalists were those who had fled the American Revolution and settled in the Maritimes. With them were a significant number of blacks, some slave, some already freed. The blacks were promised land and the right to practice their skills and trades for their own advantage. With out own sad, sinful experience, we Americans were not surprised to learn that the land they were given was too wooded for cultivation and located some 19 miles outside of the city, too far for their skills to be commercially viable. Even the Catholics were only exiled to a mile away. Then we walked the Fundy trail to see more lupin and buttercups, a rare wild orchid, waterfalls and a deep cove where the lumber industry had once flourished. We returned to St. Martin’s for a delicious dinner that did not include lobster. Down in the cove, lobster traps and gear were being dismantled and stored. It was the last day of the lobster season. We gathered, as arranged, to free our lobster. In the interim, he had somehow gotten named George. His owner showed his catch off with aplomb. We were the paparazzi, cameras and cell phones at the ready. Then the tape that kept his pincers closed was cut and George was put into the water. For a few minutes, the water rejected him. Small wavelets threw him back onto the dry sand. Perhaps he had lost the sea scent that the bay waters would recognize. Nor did George seem eager to venture forth. Perhaps he was reluctant to lose his star standing in oblivion of the sea. Or maybe he thought that, at ninety, he had lived long enough. Finally however, he was in deep enough to start floating away. A few gentle foot nudges had helped. And that was that. It was time to board the bus for Halifax, the point at which we had started the journey. In Halifax we could walk once more in the vibrant city, hear the story of the great Halifax explosion of 1918 and pack for home. I knew I would board the plane with oodles of pictures in my mind and my IPad–Gosh, did I actually take all those pictures of buttercups?–but very ambiguous feelings about lobster as an entree.